To the right you will find an example of our `a la carte menu showing the thirty activities that must be completed to buy your dream home. Column B lists the activities for our Traditional Full-Service Buyer Representation- where we do all the work. 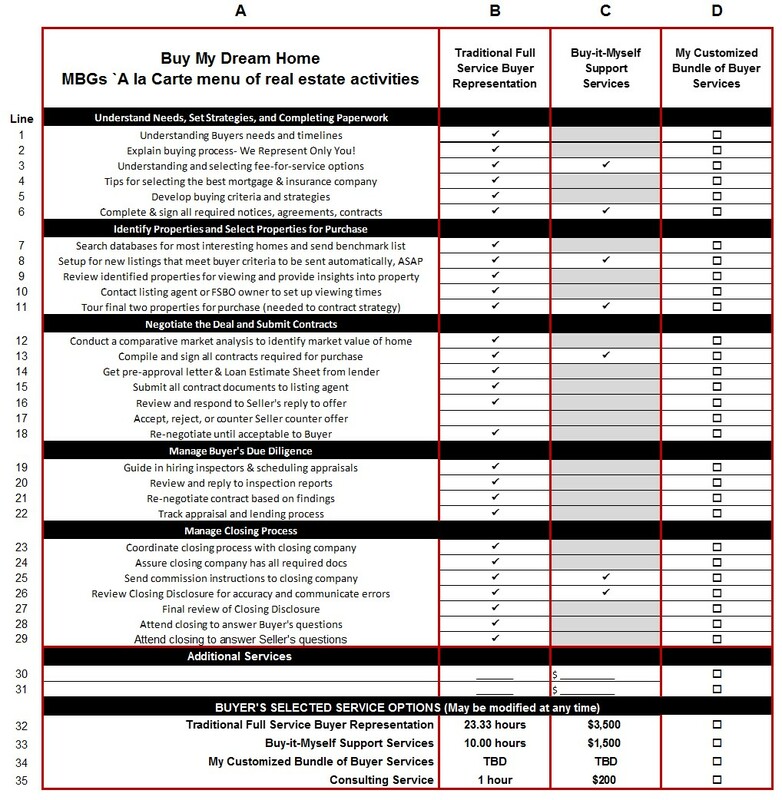 Column C lists the 7 activities included in our Buy-it-Myself Listing Services (we do the contractual work). Column D provides open check boxes so you can pick and choose only those services you want us to complete for you using our Customized Bundle of Buyer Services. At the bottom of the chart, you will also see listed our Consulting service option for those who only need open and honest answers to their questions throughout the process. Because our Commission FREE Real Estate Services are based on you paying a fair hourly fee for those items you select, and we complete for you, you can enter the process and exit the process, and add or remove activities at any time without penalty. Below we provide a few scenarios, or situations, that buyer who decided not to use our Traditional Full-Service Buyer Representation option, but sought us out and used our `a la carte menu to save the most money by only requesting help as needed. This is not an option using any other firm. Scenario 3: Managing Inspections. Because of previous experience and knowledge, this time you decided to buy your home on your own- without any help. However, yourself, and your lender, require certain inspections to be done by a qualified inspector to protect you and reduce lender risk. You could use some help to find a highly qualified inspection that meets all state requirements, schedule the inspection, review the inspection report when completed, and renegotiate the current contact based on those findings. In this situation, you could hire us to complete just those activities for you, entering the process on line 19 and exiting the process on line 21 once all the negotiations were completed. Learn more at "Saving Buyers Thousands"